Save Medical Marijuana Delivery in California! Eaze is passionate about helping patients access medical marijuana safely and professionally. We believe technology and common sense regulations will help keep communities safe while also ensuring critical access to patient medications, and we have been reaching out to regulators and lawmakers to contribute to this discussion. You may have heard that certain cities across California have chosen to enact delivery bans which restrict valid medical marijuana patients from safely accessing their medication. Unfortunately, some of these bans have affected cities where dispensaries using Eaze technology were operating. But for change to happen, local lawmakers need to hear from their residents too! It's critical for City Councils to understand how medical marijuana and delivery helps people in their districts treat their pain, seizures, side effects of chemotherapy and support other palliative care. We need your help to ensure that delivery remains accessible. 3.Share your story of how #MarijuanaHelps:It's important for lawmakers to understand how medical marijuana and delivery helps real people in their districts. Real stories can help ensure reasonable public policies. If you would like to share your story, please fill out this brief form and let the world know how #MarijuanaHelps you or someone you love. Want to do more? Email us at pleasehelp@eazeup.com and include your telephone number and we'll contact you with more ways to make a difference. When will Eaze technology be back in my city? While we don't have exact timing, we're doing everything we can from educating our patients about what they can do to help, to reaching out to local City Council members and other public officials all the way up to Sacramento to help them understand how Eaze technology can actually help Cities to permit and regulate safe access to medical marijuana. As fast as these cities shut down delivery, they can reverse the bans. 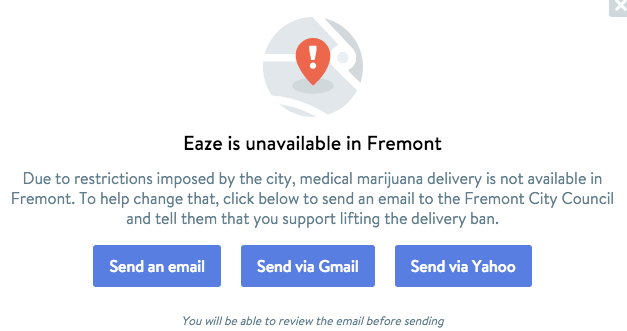 Trust us, as soon Eaze technology can be used for safe, legal delivery in your city, you'll be the first to know!